28 January was a highly significant date for the first two Tudor monarchs, Henry VII and his second son Henry VIII. It marked the birthday of the Tudor dynasty's first monarch, in 1457, and ninety years later, it would be on 28 January that Henry VIII died, ending his turbulent 38-year reign. It's perhaps a touch ironic that these two milestones occurred on exactly the same day. Henry Tudor was born on 28 January 1457 at Pembroke Castle, the only son of Edmund Tudor, earl of Richmond, and his formidable wife Lady Margaret Beaufort, who was barely thirteen when she gave birth to Henry. Edmund had died three months before his son's birth as a result of plague, a lethal killer in late medieval and early modern Europe. Margaret devoted her whole life to promoting the cause of her son, whom she believed to be England's rightful king. Loyal Lancastrians, the eclipse of Henry VI meant that Margaret became obsessed with the idea of her son resurrecting the rightful Lancastrian line in the person of his kingship. Eventually, her ambition came to fruition, and in 1485, at the age of 28, Henry Tudor became king of England after defeating Richard III, the last Yorkist king, at the Battle of Bosworth. He took to wife Elizabeth, daughter of Edward IV, with whom he sired at least seven children, four of whom lived to adolescence (his eldest son Arthur died at fifteen). In 1509, after a reign characterised by dynastic tragedy, political instability and the threat of renewed civil war, Henry died aged 52. He did, however, successfully allow the crown to pass to his son Henry without the outbreak of pretenders laying claim to it. An uncontested succession had not been experienced in England hitherto since 1422. 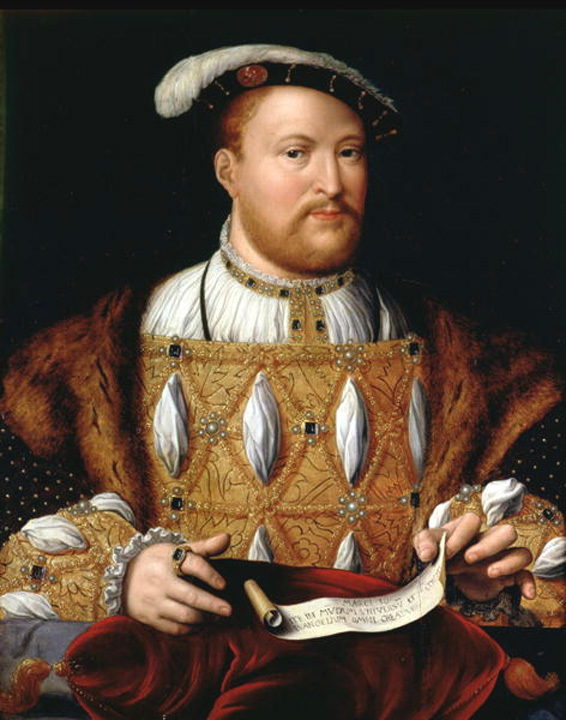 Henry VIII had been born in 1491. He was extremely close to his mother Queen Elizabeth, and her death in 1503, when the young prince was not yet twelve, appears to have severely affected him psychologically. His relations with his father were, famously, less cordial, and were at times overtly hostile. In 1509, just before his eighteenth birthday, he succeeded to the throne of England, and took to wife Katherine of Aragon, the former consort of Arthur. Her inability to provide a male heir, however, and the king's passion for Anne Boleyn led him to seek an annulment of his first marriage and a remarriage to the alluring Anne. Although this indeed came to pass, it inflicted the English Reformation on the people of England and was characterised by much bloodthirst and destruction in the wake of Thomas Cromwell's reforms. Mary and Elizabeth were born to Henry by his first two wives; and Jane Seymour finally provided the king with his long desired male heir in 1537, Edward. Three short marriages followed; although the king did manage to enjoy a peaceful and fairly untroubled final marriage to Katherine Parr. In 1547, at the age of fifty-five, Henry VIII died. Despite his military shortcomings, marital disasters, and difficult political decisions, Henry has remained one of England's most enigmatic and famous kings, and was extremely popular among his subjects. His children, particularly Elizabeth, delighted in him; although Mary may have been less close to her father than her two younger siblings. Henry's death paved the way for his nine-year old son Edward's succession, who was to die, tragically, before his sixteenth birthday in 1553. Thus 28 January was a monumental day for the Tudor ruling dynasty. It began with an extremely difficult birth in a secluded castle in Wales, endured by a thirteen-year old girl who would prove unable to bear any more children. The child's father was not absent, having died months earlier. Ninety years later, in an exceptionally different political, religious and dynastic climate in England, that king's son died at the age of fifty-five, leaving behind a controversial legacy of religious turmoil, dynastic bloodshed, and personal charisma which continues to prove irresistible to modern audiences today. On this day in history, 25 January 1533, Henry VIII of England married his second wife, Anne Boleyn, in secret at Whitehall Palace (Jane Seymour would also marry the king there, in 1536). Archbishop Cranmer wrote to Archdeacon Hawkins that 'she [Anne] was married much about St Paul's Day', which fell on 25 January. The marriage was kept so secret that the usually well-informed Spanish ambassador Eustace Chapuys was writing in March of rumours of a wedding in April. 'The which marriage was secretly made at Whitehall very early before day, none being present but Mr Norris [who was later executed for supposed adultery with Anne] and Mr Heneage of the Privy Chamber and the Lady Berkeley, with Mr. Rowland the King's chaplain, that was afterward made Bishop of Coventry and Lichfield. To whom the King told now that he had gotten of the Pope a lycence to marry another wife, and yet to avoid business and tumult the thing must be done (quoth the King) very secretly; and thereupon a time and place was appointed to the said Master Rowland to solemnize the said marriage'. 'The kyng, after his returne married priuily the lady Anne Bulleyn on sainet Erkenwaldes daie, whiche mariage was kept so secrete, that very fewe knewe it, til she was greate with child, at Easter after'. It's therefore likely that the couple underwent a secret marriage, or betrothal, ceremony in November, and then participated in a second secret ceremony at the end of January. By February 1533, so the story goes, Anne was already hinting of her pregnancy, and by April, she was England's acknowledged queen. In June 1533 she was crowned Queen of England, and in September delivered her first (and only) child, Elizabeth. Above: Anne Boleyn and Henry VIII probably entered a secret marriage ceremony in November 1532, consummated their union, before undergoing a second secret ceremony in January 1533. Gareth Russell challenges the traditional view that it was upon discovering Anne's pregnancy in December 1532 that the King proceeded to marry her the following January: 'Psychologically, historically and even biologically, there are major flaws in the idea that Henry VIII and Anne Boleyn commenced a sexual relationship in November 1532, conceived a child in December 1532 and were married in January 1533'. Russell concludes that 'Anne's pregnancy, which is often giving as the main (if not sole) motivating factor for the date of her wedding, in fact played absolutely zero role in her rise to the throne. Anne was following custom, not panicking about biology, on January 25th 1533'. Thus, although it is certain that the couple married on 25 January, it seems likely that they had previously undergone a secret ceremony in November 1532, before consummating their union. Anne quickly conceived, for Elizabeth was born the following September. One can only imagine how the couple must have felt. They had been involved in an intensely emotional, spiritual and sexual relationship dating back to 1527, comprised with anxieties, concerns and pressures about when they would finally be able to marry. Some six years later, their dreams were realised. Anne was at the pinnacle of her ambitions, for she had finally risen to England's queenship, as she had confidently first expected to do in 1527. The Royal Albert Memorial Museum has been voted Museum of the Year before, and its latest exhibition entitled West Country to World’s End: the South West in the Tudor Age means it’s not hard to see why. Being an avid lover of all things Tudor, I went along to RAMM to check out this exhibition, and I wasn’t disappointed. When arriving, a talk is provided lasting around an hour in which some of the key features of the exhibition are looked at in greater detail and context. Led by Professor Sam Smiles of the University, the talk centred on the suggestion that, in studying the Tudor period, too much attention is granted to the court and to London, the seat of monarchical and aristocratic power, rather than to the provinces. But the South West has an intriguing and vibrant history in the Tudor age, and Smiles feels that this is well worth exploring further. During the Elizabethan ‘Golden Age’, people of the West Country were innovative in their endeavours. Francis Drake sailed to the ‘World’s End’ in pursuit of glory and riches, while Walter Raleigh took settlers to a new world. The talk also focused on the greatest Elizabethan portrait painter, the miniaturist Nicholas Hilliard, and scholar Thomas Bodley (the Bodleian Library in Oxford is named after him). Alongside recounting the adventures and exploits of these enigmatic individuals, the talk looked at goldsmiths, plasterers, carpenters, masons and lacemakers, and the key role they played in the South West. The exhibition includes items from the Bodleian Library, the British Museum, the British Library, the National Portrait Gallery, the National Trust, the Royal Collection, the Victoria & Albert Museum, and Royal Museums Greenwich. Items related to the Spanish Armada of 1588 provide fascinating glimpses into the danger posed to the western counties, which were ultimately able to defeat the threat of Spanish invasion. The exhibition is well worth seeing, particularly because it focuses on an aspect of the Tudor age not centred on the court, Henry VIII, or his six wives. Instead, it rightly emphasises that intriguing insights into industry, politics, the economy, and society in the sixteenth century can be attained by looking in greater detail at other areas of England. The South West, it’s clear, enjoyed an adventurous and exciting history in the Elizabethan age. 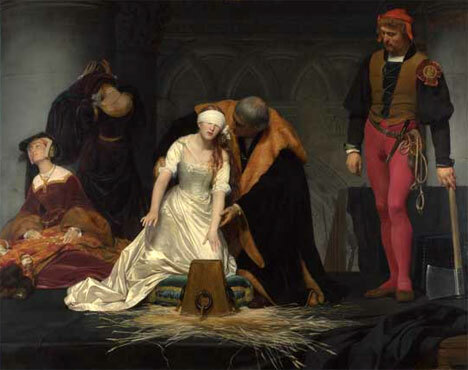 Above: Paul Delaroche's The Execution of Lady Jane Grey (1833). I recently finished reading Professor Eric Ives' Lady Jane Grey: A Tudor Mystery (2011), and in the final chapter Ives describes the cultural presentation of England's thirteen-day queen in literature, film, art, and plays since her untimely death in 1554. As Ives notes, Lady Jane Grey ceased to exist as a person, but instead became a construct, to be manipulated and utilised by individuals to suit their own ends, reflecting the political, social and cultural contexts in which they lived. As a result, the portrayal of Jane in the Elizabethan period differed greatly to that offered by the Victorians, which in turn differs to how she is represented today. A brief history of Lady Jane's life: Jane was the eldest daughter of Henry Grey, marquis of Dorset (1517-1554), and his wife Frances Brandon (1517-1559), who in turn was the eldest daughter of Mary Tudor, younger sister of Henry VIII. As such, Jane was the grand-niece of Henry VIII. 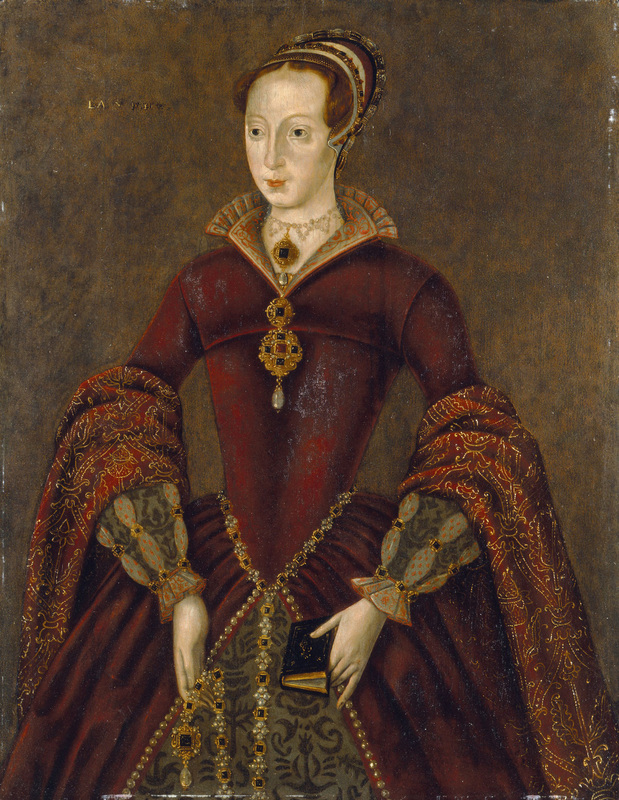 She was likely born in the spring of 1537 at Bradgate in Leicestershire, and she had two younger sisters, Katherine (born 1540) and Mary (born 1545). Her education was, famously, renowned; she was a talented linguist, a cultivated humanist and, above all, a devout Protestant. Her childhood was spent in the household of the queen dowager Katherine Parr, last consort of Henry VIII, where she was educated alongside Princess Elizabeth Tudor. Jane, despite her prominent position as a descendant of the first Tudor king, Henry VII, was quite obscure, and it was only in the summer of 1553, aged sixteen, that she became well-known in the kingdom at large. Edward VI, aware that he was dying in 1553, masterminded the 'deuise for the succession' in which he barred both his half-sisters Mary (daughter of Katherine of Aragon) and Elizabeth (daughter of Anne Boleyn) from inheriting the English crown, by virtue of their status as bastards. As such, he designated the crown to pass to the heirs of Henry's younger sister Mary Tudor, meaning Lady Jane Grey and any sons she bore with her husband Guildford Dudley. When the king died in July 1553, Jane was proclaimed queen of England. However, she was defeated by Mary Tudor, the dead king's eldest half-sister. Imprisoned in the Tower of London, Jane was tried and found guilty of high treason alongside her husband, her father-in-law, her brothers-in-law and Archbishop Cranmer of Canterbury. In February 1554, following the failure of Wyatt's Rebellion, she was executed on Tower Green, some months shy of her seventeenth birthday. From the moment of her death, Jane became an enigma, to be manipulated and represented in a manner of ways by artists, writers, playwrights and film-makers. The late sixteenth century celebrated her as a Protestant martyr, who had died for her faith in the cruelty of the Catholic Mary Tudor's reign. A continuing theme which developed in the Victorian age saw the celebration of Jane's virtues, and she was viewed as the embodiment of goodness and godliness, an example to Christian children in both Britain and the USA. Jane the scholar was a prominent theme in many works. Again, she was used as an example to the young to work hard at their studies. Jane's formidable academic achievements were continually highlighted and celebrated, viewed as something to look up to and work towards. Above all however, perhaps, the portrayal of Jane Grey which most people understand is that of Jane the victim. Beheaded at only sixteen, in the flower of her youth, Delaroche's 1833 painting (at the top, above) conveys a sense of a youthful girl, mercilessly killed for crimes she has not committed, an 'innocent traitor' (the title of Alison Weir's 2006 novel). Again, she stood in contrast to the cruelty and brutality of Mary Tudor, their different faiths meaning that they stood poles apart. Jane was viewed as a victim of corrupt and scheming men, including members of her family, who ruthlessly desired to attain greater power for themselves. Although Delaroche's painting was inaccurate in many respects (the costume, the setting, for example), it is an extremely famous portrayal of the thirteen-days queen and the brutality of her death. 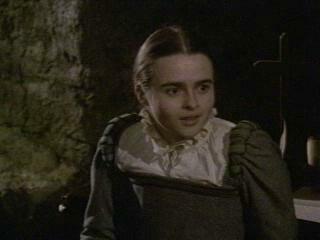 Above: Helena Bonham Carter as Jane in the 1985 film Lady Jane. If early modernists celebrated Jane as a Protestant martyr, and the Victorians viewed her as a manipulated and bullied child who, nonetheless, was the epitome of virtue, then it seems credible to suggest that Jane has been represented as a defiant, opinionated and stubborn young woman in the twentieth- and twenty-first centuries. The 1985 film Lady Jane, starring Helena Bonham Carter, emphasised Jane's commitment to Protestantism but also portrayed her in a more sensual manner through focusing on her marriage to Guildford Dudley. Historians, however, have been quick to point out Jane's stubborn and determined qualities - in Ives' view she was a woman of 'fierce personal integrity'. Because of her young age at death, and because of the obscurity of much of her life, we know very little about Lady Jane Grey as a person. She is an enigma. Consequently, when discussing her, we focus on Lady Jane the construct, what she embodies for us, how she is represented in our own times - and before. It might be worth considering how she will be represented and manipulated in different mediums in the future. There’s something funny about rebellions in history and the feelings of nostalgia central to them. Take the Peasants Revolt of 1381 (pictured above), led by Wat Tyler in opposition to political and social grievances, economic problems resulting from heavy taxation, and instability in local leadership. The rebels (who weren’t even peasants, mostly) tried to justify their uprisings by claiming that they weren’t angry with the king himself, but were merely hostile to his advisers and law enforcers. They desired, they insisted, a return to “the good old days”, when serfs and lords were equal, instead of lords ruthlessly oppressing serfs economically and politically. Take the infamous rhyme which was ubiquitous during these events: “when Adam delved and Eve span, who was then a gentleman?” (ie. in the Garden of Eden, everyone was created equally – there were no such things as lords, serfs, and nobles). But it was very ironic that these rebels looked ideally back to a golden past in which, or so they believed, social equality was respected, and lords and serfs worked peacefully together. Oppression and inequality were unknown. But the historical facts relating to medieval England don’t bear this out. Many modern historians, for instance, suggest that the conditions of serfdom were actually better in the fourteenth century, compared with the harsher preceding centuries. Proving that this misguided belief wasn’t just a one-off in the dire climate of 1381, insurgents in the 1549 Prayer Book Rebellion in southwest England demanded the deaths of gentlemen who they felt to be unlawfully oppressing them. Nostalgia for the not-so-distant past was present in a religious sense, for the rebels desired a return to the conservative ceremonies and practices of Henry VIII’s church. Of course, nostalgic desire for the good old days surfaces not just in rebellions but in many other contexts. Medieval historians have suggested that women across Europe may have experienced a 'golden age' in terms of both living and working conditions, enjoying a degree of freedom harshly restricted in the early modern period. But specific to this article is rebellions and the feelings they produce of nostalgia and hatred of present day life as it stands. Rebels in both the 1381 and 1549 risings were deluded in thinking that the ‘good old days’ were infinitely better than they were at the time of the rebellions, but they can surely be forgiven for wishing to escape what may have seemed to them a life not worth living.